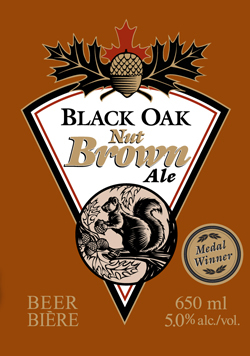 Black Oak Nut Brown Ale is brewed with Canadian two-row, chocolate and crystal malts and toasted wheat. It is hopped with Northern Brewer, East Kent Goldings and Hallertau hops. Expecting nuts, I’m surprised a bit by the aroma of berries with my first sniff, and I examine the color again. It’s mahogany, but around the edges it’s like a fruit juice of multiple origins. Its dry and slightly astringent profile agrees with the nut brown distinction. There is more to this beer, thanks to the cold caramel and chocolate flavor that lends itself to lip-smacking between sips. This for me is a dessert beer. Crème brûlée, or fresh berries and cream with a maple drizzle would work well. From my 2013 Ontario Brewery of the Year, so it had best be good! Deep brown in color, the nose very much true to its name, nutty with toasted hazelnut notes and background aromas of chocolate and smokehouse almonds. The front is sweet and slightly nutty, leading to a more roasted, bitter chocolaty body with flavors of toasted buckwheat and dried cherries, finishing dry, toasty and just a little on the quick side. Maybe not quite big enough for the Sunday roast, but perfect for Monday’s cold beef sandwiches. John is the editor of All About Beer Magazine, the host of The Beer Briefing on iHeart Radio, and the author of three books, including The American Craft Beer Cookbook. Find him on Twitter @John_Holl. Co-author of both The World Atlas of Beer and The Pocket Beer Guide (with Tim Webb), Stephen travels the world sampling beer, hosting dinners and tastings, and eating too much airport food.